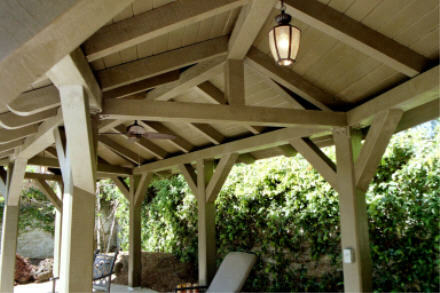 Wood patio covers custom designed and built in Los Angeles. Wood patio covers, wood trellises, arbors, pergolas or any kind of garden or patio structure I can design and custom build to suit your specific situation and needs. I am an artisan builder who demands excellent workmanship and results. They can be roofed or open lattice, attached to the house or free-standing, and we match it up to the existing or desired architectural style. Patio cover in Los Angeles. 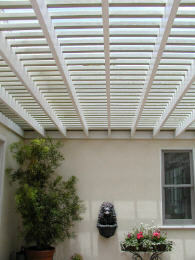 Patio Cover in Pacific Palasades. Trellis structure in San Marino. 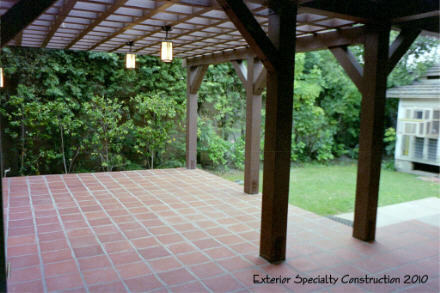 Solar Patio Structure in La Crescenta. Patio Structure in Studio City. Pool house interior finish work in La Canada.